The winter months are a wonderful time here at Lake Pointe Inn. Snow covers the frozen lake, creating a serene and peaceful atmosphere. Plus, our Deep Creek Lake bed and breakfast is ideally located near many attractions, making it the ideal accommodation choice when staying in the area. One of our favorite winter activities to recommend to our guests is taking a sleigh ride at Pleasant Valley Dream Rides. This quaint farm has horse drawn sleigh rides, carriage rides, tours of the farm, and more. For a peaceful and unique experience, try gliding over the snow in a sleigh being pulled by stately steeds. A stay at the Lake Pointe Inn and trip to Pleasant Valley Dream Rides will make your Deep Creek Lake winter getaway one to remember. Pleasant Valley Dream Rides take visitors on a beautiful tour of the region known as Pleasant Valley in the Amish country of Maryland. The location is picturesque and ethereal in the winter. The beauty of the area will be enhanced by the knowledge of your guides and the calming atmosphere. Pleasant Valley Dream Rides has several activities for visitors to participate in during the winter. 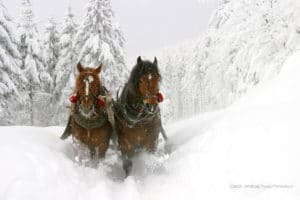 The most popular winter activity at Pleasant Valley Dream Rides is definitely a horse drawn sleigh ride across the countryside. You can snuggle up under a blanket and ride along with a special someone as you feel the crisp cold air in your lungs. Your sleigh driver can tell you all about the area and the local history and folklore. These sleigh rides are available during the day, and also at night, for a magical experience under the starry sky. Sleigh rides are not the only activity available during the winter at Pleasant Valley Dream Rides. Carriage Rides and Hay Rides through the pastoral setting are also offered all year. And you can see how an Amish Dairy Farm works with one of their Farm Tours. You’ll learn the Amish way of cow milking compared to how cows are milked today. And then you find out about the process the milk goes through before hitting grocery store shelves. It’s a great inside look at a disappearing tradition complete with hands on demonstrations! When you plan your visit to Pleasant Valley Dream Rides, be sure to book a stay at our McHenry bed and breakfast. Lake Pointe Inn is the perfect place for a winter getaway whether you want to take a sleigh ride, ski, or just take it easy around the Inn. Lake Pointe Inn’s Arts and Crafts style decor lends a welcoming warmness to the property. Our gorgeous rooms and suites will keep you in comfort during your time in Deep Creek Lake with Mission Style furniture and Arts and Crafts decor including William Morris fabrics. Each room is individually decorated for a unique and homey feeling. Amenities in the rooms include private bathrooms, gas fireplaces, and comfortable beds with luxurious linens. You’ll get a wonderfully relaxing night followed by a delicious homemade breakfast each morning so you’re sure to have a rejuvenating experience. We can’t wait to have you with us soon!